Andreas Strasser is a world leader in cancer and immunology, with a particular focus on the role of programmed cell death (apoptosis). By exploiting mouse genetics, he was the first to demonstrate that abnormalities in the control of apoptosis can cause autoimmune disease and amongst the first to show that this can cause cancer and render tumor cells refractory to anti-cancer therapy. These discoveries have major biological implications and suggest novel therapeutic strategies for cancer, autoimmunity and degenerative diseases. Current research interests include identification of the signalling pathways that mediate developmentally programmed cell death in mammals and those that are responsible for chemotherapy-induced killing of cancer cells, with the goal to develop improved strategies for treatment of cancer and autoimmune diseases. Andreas Strasser earned his PhD at Basel Institute for Immunology under Fritz Meichers in 1988 and moved for postdoctoral studies under Suzanne Cory to the Walter and Eliza Hall Institute in 1989 where he has remained ever since. He has been a Senior, Principal, then Senior Principal Research Fellow, then Australia Fellow of the National Health and Medical Research Council. Since 2006 he has been the Joint Division Head of the Molecular Genetics of Cancer Division at Walter and Eliza Hall Institute. He has published more than 240 primary research papers as well as a further 100+ review articles, and has received more than 35,000 citations overall. He has been recognized with the Burnet Prize, the Josef Steiner Cancer Research Prize, the Friedrich Miescher Prize from the Swiss Society for Biochemistry, shared the Glaxo Wellcome Australia Prize with Professor David Vaux, and the Victoria Prize in 2011. 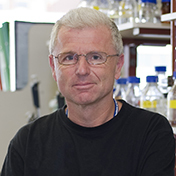 In 2003 he was elected to the Australian Academy of Science and in 2009, became a foreign associate member of the European Molecular Biology Organisation.